22-Feb-2016 -- Driving east from Dubbo, I visited this very easy degree confluence point, which lies just 120 m south of a country road (Darkwood Road), which in turn is reached via just a short detour off the Golden Highway. The point lies in a grassy field. Parts of the field (including the point) are fallow; other parts of the field have wheat growing. This point was last visited more than 9 years earlier, by Stephan and Yannick Theriault. 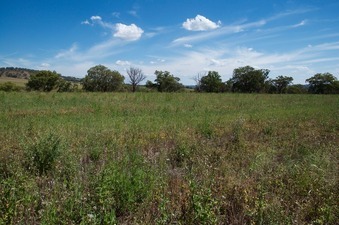 Back then, the area was in a severe drought, and the Theriaults reported that the field - containing the point - was bone dry, with nothing growing. I’m pleased to report that - 9 years later - the area has recovered.